At the age of 18, in December of 1994; sitting in a bedroom in suburban Arizona with a fine young lass and a water-pipe filled with Mexico’s finest herbal remedies, my life and my appreciation of cinema would take a turn as I watched — mesmerized — Easy Rider for the first time. Captain America and Billy would ride freely through the South West toward a mythical idealism manifested through Mardi-Gras. Yet it ultimately was a hollow and empty journey such as our own lives when we force meaning on the intangible quests that we participate in. Never had I been within a film before or since. Not only a road movie or a post-modern western, but a footnote of a history of American culture that I naively thought was the epoch of the revolutionary fervor that I so yearned for. Yet the fight against the oppression exemplified in Easy Rider would ultimately be a paradigm for my contempt and feelings of inadequacy as they related to my own struggles, inward and outward, in finding peace within myself and justice within society at large. The abstract meaning of the film, as I would ultimately come to realize with a few years of experience behind me, is that freedom is but an illusion and our journey through life’s dirty highways are the true freedoms that we strive for. 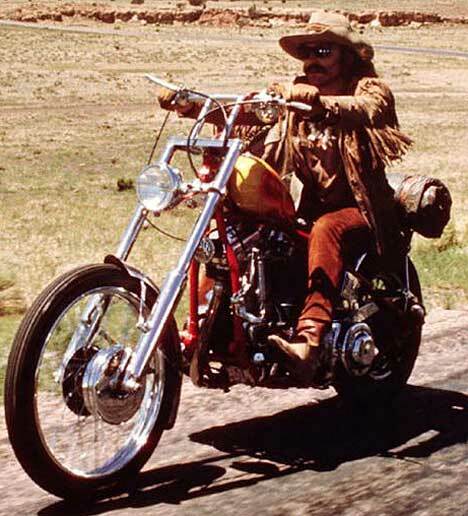 Hopper had a role in writing, directing and of course acting in Easy Rider. His life would ultimately be a series of self-perpetuated psychic destruction at the hands of drugs, yet he continued to find success and good fortune on the silver screen despite his personal flaws. Dennis Hopper contributed greatly in his own way by adding to the diversity and history of a nation that I can be proud of. Hopper’s America was not absolute nor easily defined, but rather it was an America that was flawed, hateful, oppressive and wholly responsible for granting us the notion of what real freedom is if we choose to follow the path of the free in whatever manner we choose to manifest that freedom. Dennis Hopper will be missed but his contributions will continue to be cherished and considered profound as time will surely tell the tale of his work and the meaning it will continue to give everyone who has been affected and touched by worthwhile cinema.